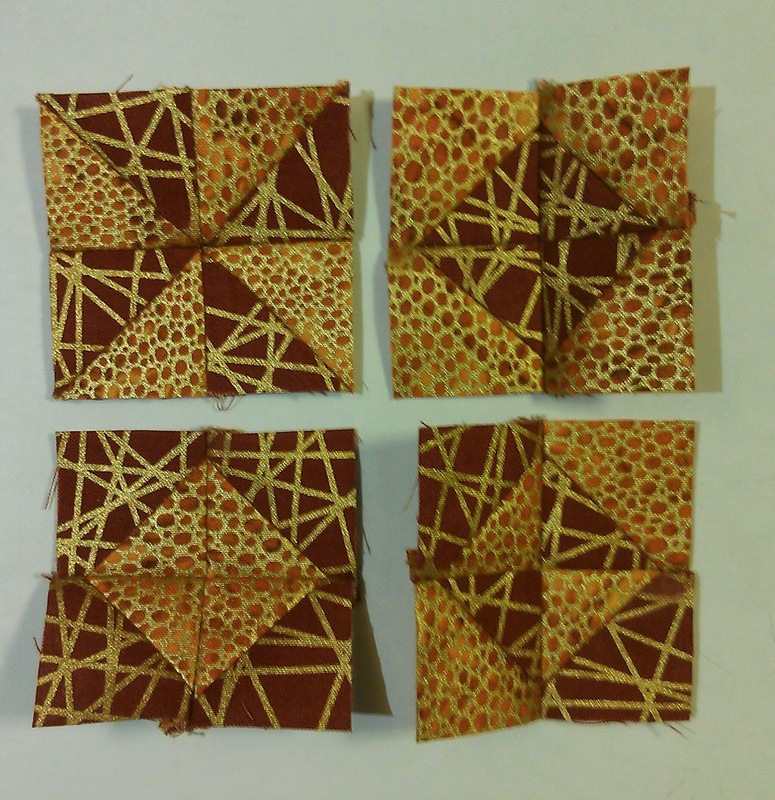 Can't Quit Quilting: Am I working on too many projects? Am I working on too many projects? I realize that I've already failed to meet my commitment to post weekly, and I also realize that I may have spread myself a little too thin with commitments (so what else is new?). Here's what I've been working on lately and what I've gotten done (mostly two weeks ago). 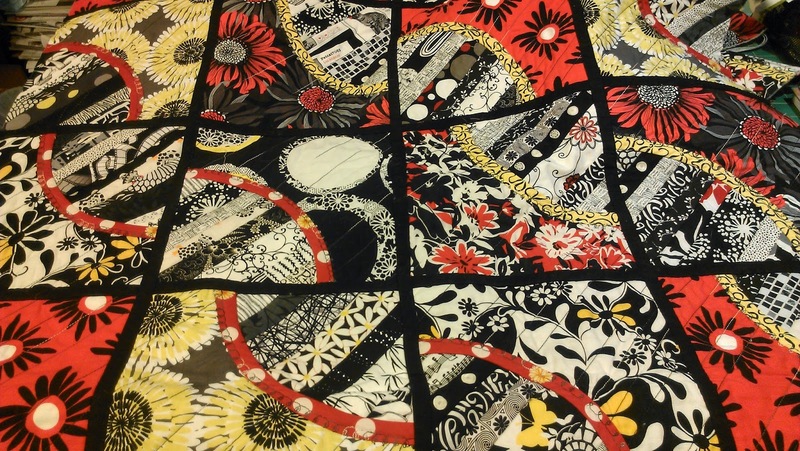 I've made more progress on my niece's black/white/red/yellow quilt. After getting the layout set a few weeks ago, I've assembled four more rows (for a total of seven out of ten) and I've fully attached one more row (for a total of four out of ten). My niece and her husband were here for a visit last weekend, so I was able to show them where it stands. They seemed pleased, but of course I did nothing on it while they were here. We spent too much time walking around the city and eating at our favorite restaurants. Now that they've left, I'm trying to keep things moving by doing some hand stitching on the assembled rows each evening (some nights more successfully than others). The theme for the Quilt Alliance's 2014 quilt contest, exhibition, and auction is Inspired By. I used a Storm at Sea quilt from the Wyoming Quilt Project as my inspiration, but on a smaller scale to fit the 14"x14" requirements of the contest. I finished the the first four pieces for my quilt-let two weeks ago. 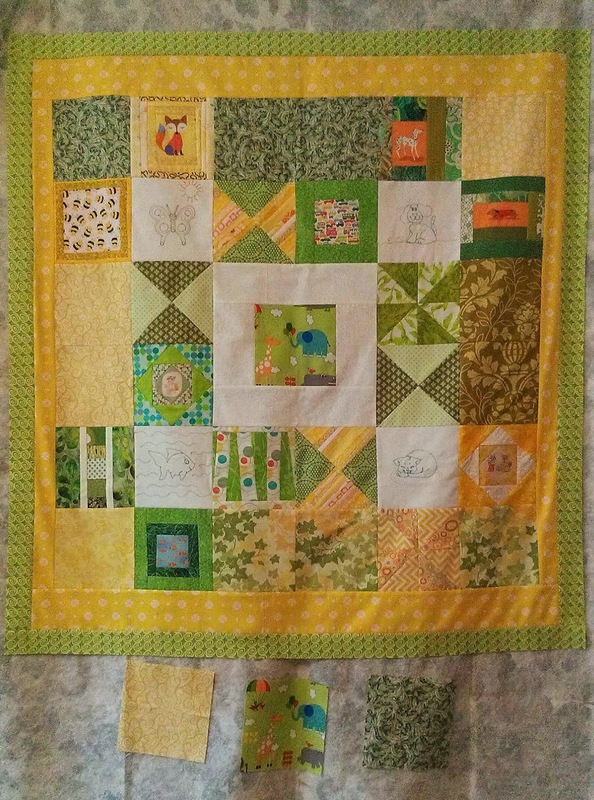 For our February guild meeting, we asked our members to make as many 6-1/2" green and/or yellow blocks for a baby quilt as they liked. It turns out that we received enough blocks for two quilts. Two of us (both, coincidentally, named Andrea) agreed to take half of the blocks and design a quilt. Despite telling our president that with everything I'm working on I most certainly would not have the top done for our meeting in April, I couldn't let the blocks sit unattended. Two weeks ago, I added the borders to my quilt top and plan to incorporate the three extra blocks at the bottom into a pieced back. Luckily, the quilt isn't due until the fall, so I have plenty of time to finish it (famous last words!). And, I made some progress on a mystery project that I need to finish by next weekend. I've tried two versions of the border and still am not happy with it. Perhaps I'll find some inspiration this weekend so that I can move on to piecing the back. Of course, this means that two projects that have been waiting patiently for some attention will have to wait a little bit longer. Seriously...how did I get to a point where I have so many projects going at once? And so, I'm off to start sewing to try to get something finished!